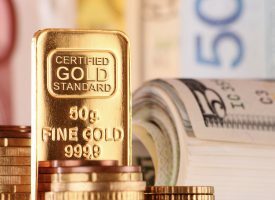 On the heels of the recent warning that a period of major stagflation is going to take place in the United States, the “everything bubble” and stagflation are about to create skyrocketing gold and silver prices. Over the past several years we have witnessed one of the greatest monetary experiments in human history. The eventual outcome remains uncertain at the current juncture. 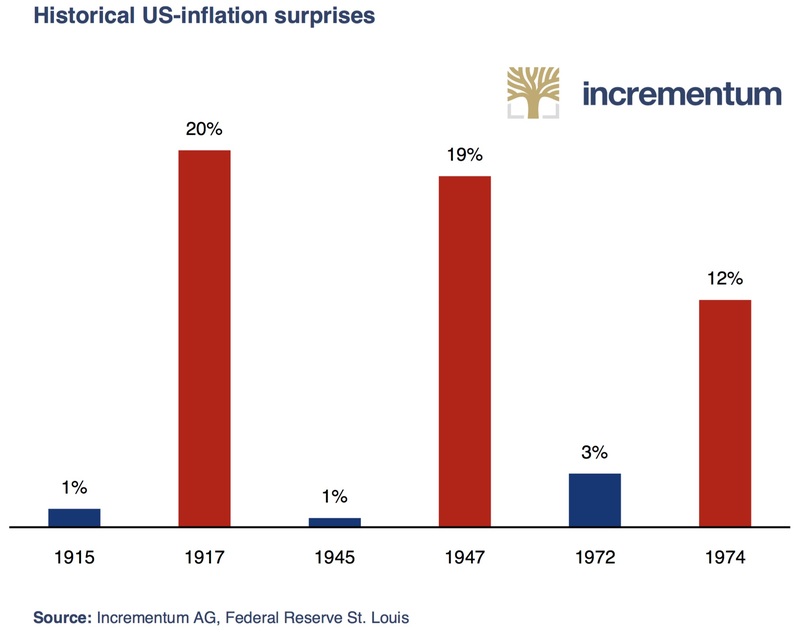 However, a humble look at monetary history does tells us the following with respect to inflation: Neither mainstream economics nor central bankers can control the specific progression of price inflation momentum. The pathetic and consistently failing attempts to regulate the pace of consumer price inflation as one would regulate a thermostat merely betray hubris and a lack of knowledge and understanding of monetary history (not to mention a reliance on theories that are highly questionable). Sharp increases in price inflation as a rule occur unexpectedly and in relatively compressed time frames. As the following chart illustrates, that has already happened many times. Contrary to the popular opinion that developed nations are characterized by very low inflation, enormous monetary inflation has already occurred. As an example: in terms of the broad true money supply TMS-2, the amount of money in the US economy is now 4.34 times the level of January 2000. Since January of 2008, the broad true money supply has increased by 141%, while consumer prices have risen by a cumulative 15%. In short, since early 2008 the money supply has grown 9.4 times faster than CPI. The effects of this monetary inflation are so far only visible in distortions of relative prices. Thus, asset prices have increased to a rather conspicuous extent. It seems more than passing strange that rising food prices are as a rule regarded as great calamity, while rising home prices are considered a blessing. Both simply reflect a decrease in purchasing power; whether it finds expression in home prices or food prices is not relevant to the fact that purchasing power has been lost (even though it does of course matter with respect to business cycle theory that a large shift in relative prices has occurred. The non-neutrality of money is reflected in these distortions, which obviously greatly affect investment decisions and the allocation of scarce resources). A decisive factor likely to determine future price inflation dynamics will be the response of the US dollar to an economic contraction. In past recessions, the dollar tended to initially appreciate against most important foreign currencies. Then the Fed adopted an easy monetary policy and the dollar’s external value decreased again. The extent and persistence of these moves depended also on the dollar’s relative value at the outset of economic downturns, as well as on other contingent circumstances (such as dollar shortages in the euro-dollar market and similar market structural or psychological aspects). In that sense, the current situation differs markedly from that prevailing at the beginning of the last downturn, as the dollar has already appreciated considerably in recent years. 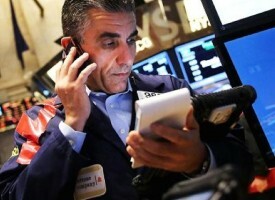 Persistent further strength in the dollar would be the exception rather than the rule under these circumstances. Should a US recession strike concurrently with a devaluation in the US dollar, investors would be faced with a very difficult situation. While in 2008, it was primarily concerns about liquidity and the fear that “not enough money would be printed” were dominant (a situation known as a “deflation scare”), the markets may arrive at a different assessment in the next downturn. That would be particularly likely if confidence in the Fed’s ability to revive the economy with another round of stimulus measures were to falter before they are even implemented. As soon as market participants consider rising price inflation to be a serious possibility, a fundamental shift in general market sentiment is likely to occur. The currently still prevailing expectation that “if there are problems, central banks will implement further inflationary measures” would be increasingly questioned if inflation expectations were to rise. 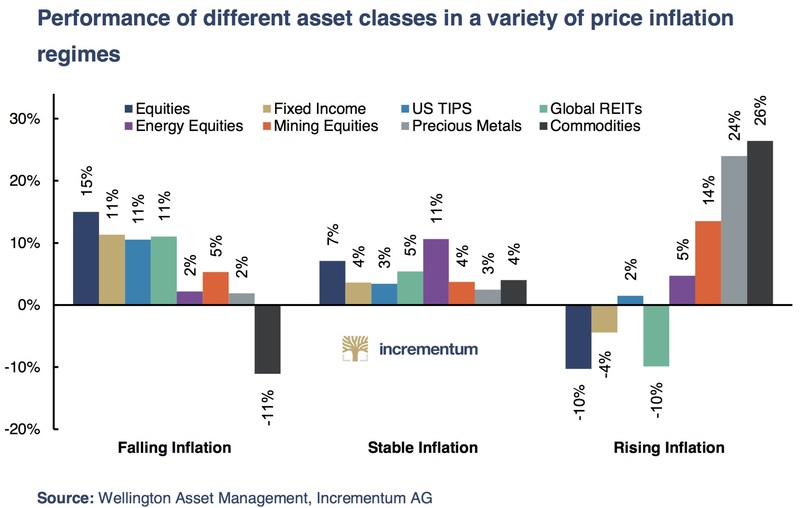 Based on this we want to discuss the performance of different asset classes in a variety of price inflation environments. Apart from precious metals, inflation-protected bonds are often cited as suitable hedges against inflation. Many investors are unaware of the fact that the inflation-protection feature essentially only comes into play at maturity. Before they mature, these bonds exhibit considerable sensitivity to changes in nominal interest rates. That is not exactly an unimportant factor in portfolio construction. In particular, long term inflation-protected bonds often face headwinds once price inflation enters an uptrend, which is usually accompanied by rising nominal interest rates. If this asset class is added to a portfolio as an inflation hedge, substantial (accounting) losses may be unexpectedly recorded in some years. As the following chart illustrates quite clearly, both stocks and bonds tend to lose ground in an environment of accelerating price inflation. Even though stocks are often considered to be suitable inflation hedges since they represent claims to real assets, historical data on this point are rather more ambiguous. Numerous studies actually show that stock prices and price inflation are negatively correlated. In other words, a surge in price inflation will normally have a negative effect on stock prices. Of course the effect varies greatly between market sectors. That is a major reason why gold stocks and the stocks of other commodity producers have attractive characteristics in the context of prudent portfolio diversification, as they are clearly positively correlated with rising inflation rates. In an environment of merely “elevated” 1970s style price inflation rates, the value of future earnings streams tends to be heavily discounted by the stock market. Many sectors will experience a sharp compression of multiples. 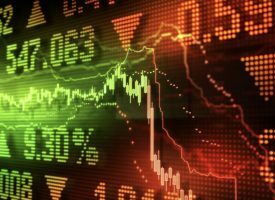 Broad stock market indexes in developed markets are liable to decline, as most growth stocks will come under strong pressure. Lower order industries close to the consumer will suffer as well, and so will domestically focused banks, especially if real interest rates are persistently negative. Stocks of capital-intensive companies in higher order goods industries such as miners or various “smokestack” industries will tend to hold up better or even thrive. These trends become even more pronounced if a country’s currency breaks down in a crack-up boom, and a hyperinflation episode begins. As an aside, it is possible to survive and even thrive in hyperinflation conditions, but it is not easy and one has to be constantly on one’s toes. Wealth preservation becomes a full-time job, and many traps await the unwary. 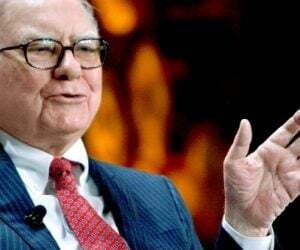 Moreover, governments will often do their utmost to prevent people from trying to preserve their wealth, as the associated activities are usually blamed for exacerbating the situation (governments presiding over hyperinflation never blame themselves or their policies). These magnified boom-bust cycles on steroids are also very dangerous because the trend is bound to eventually rapidly reverse after which a “stabilization crisis” will commence (as a rule this happens overnight, once the official medium of exchange is completely repudiated). What was valuable and sought after can become an instant liability, while assets and business sectors that were previously shunned will begin to recover and thrive again. The average citizen is probably best served by holding precious metals and foreign investments if it becomes necessary to deal with such circumstances. How Much Longer Can This Continue? 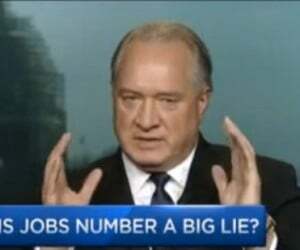 The solution will therefore be to “prime the pump” at the slightest hint of an upcoming recession. So far, this policy has been deflationary as it creates excess capacity and brings future demand into the present, however, at some point it will lead to reduced demand for cash with cash-holders losing confidence in the currency they hold. The transition from deflation to inflation will certainly feel like a proper recovery, but it will turn out to be the final dead cat bounce just prior to a new, stagflationary cycle. 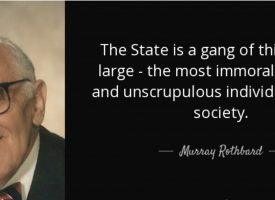 The all-encompassing redistributive welfare state, which either directly through taxes or indirectly through the monetary system continually shifts and reallocates large amounts of capital, manages to paper over the effects of capital consumption to some extent. It remains to be seen how much longer this can continue. 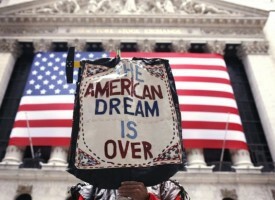 Once the stock of capital is depleted, the awakening will be rude. We are certain that gold is an essential part of any portfolio in this stage of the economic cycle. 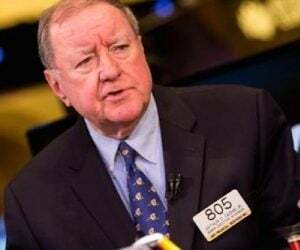 … At this point, gold is primed to show its true colors as a safe haven asset and appreciate in both absolute and relative terms. 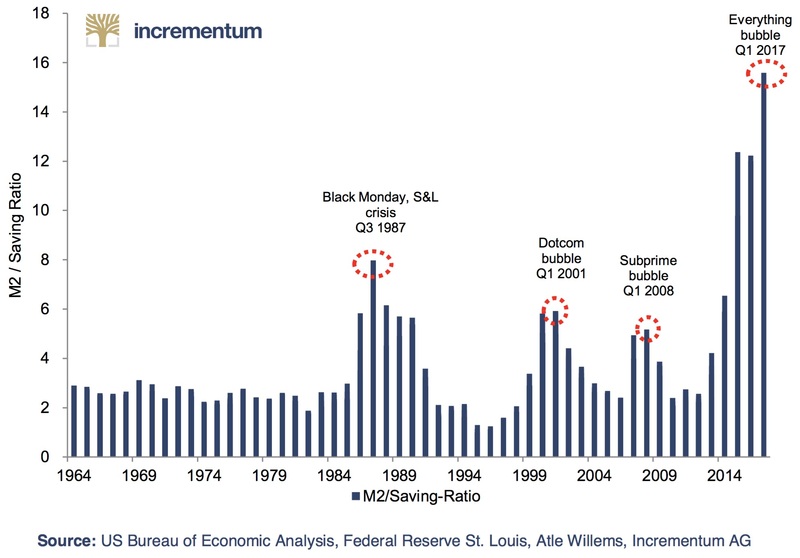 The chart below reveals how peaks in the MS/S ratio for the U.S. economy regularly are associated with the end of inflationary booms and the onset of financial crises. And gold did indeed prove its true colors in the aftermath of previous peaks in the MS/S ratio, most notably following the 2001 and 2008 peaks. 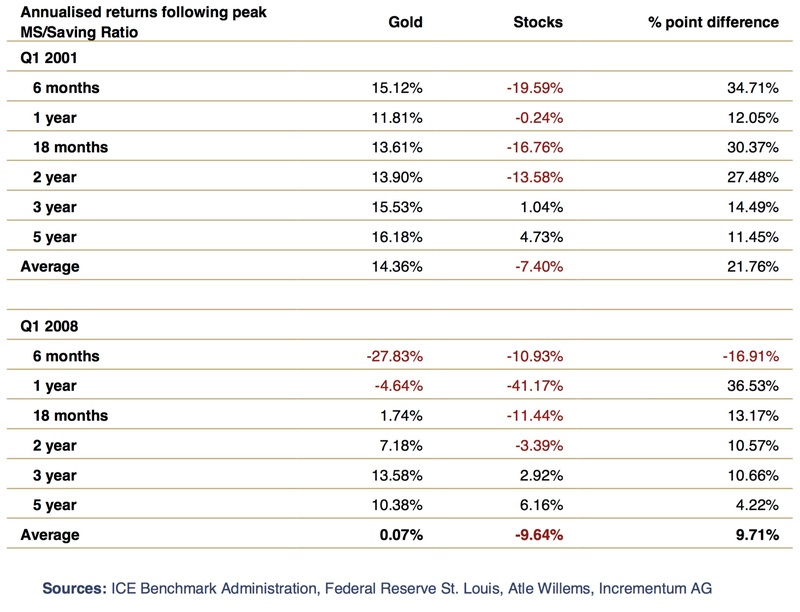 The table below depicts the annualized price changes in gold and stocks (Russell 3000) for six different time periods following the 2001 and 2008 peaks in the ratio. The table shows that gold appreciated 13.6% on an annualized basis during the 18- month period following the Q1 2001 peak in the MS/S ratio while stocks declined 16.8% on the same basis. Gold hence outperformed stocks by 30.4 percentage points (annualized) over this period. Overall, gold appreciated considerably over 18-month intervals following peaks in the ratio and decisively outperformed stocks on all occasions but one; the six-month period following the 2008 peak. 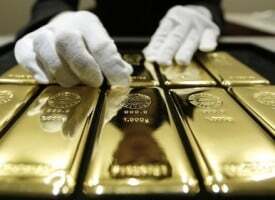 King World News note: Keep in mind that when the United States went through stagflation in the 1970s, gold soared 25.5-times in price and the price of silver went up 38-times. When the pendulum swings in gold’s favor and away from stocks, the upside gains in the gold and silver markets will be breathtaking. ***ALSO JUST RELEASED: Commercials Are Shorting Massive Amounts Of This Commodity. Hint: It’s Not Gold CLICK HERE.